Last week I travelled to Ashford Stud, Kentucky to install my most recent life size portrait bronze of the three time champion sire Giant’s Causeway. Also known as the Iron Horse, Giant’s Causeway has been a brilliant subject to sculpt. He is the most well proportioned horse I’ve studied so far and a great temperament to match. I did two visits to Ashford to make week long studies of him before making a start on the life size clay at the studio here in Wiltshire. The bronze took 9 months to complete. It was shipped by boat to the U.S which took 8 weeks and on Monday I flew out to meet it and oversee the installation. Sculpting this huge horse, nicknamed ‘The Moose’ has given me a chance to move away from the traditional stallion conformation pose. He is such an imposing horse that I suggested he should be sculpted galloping around his paddock to better show off his awesome physicality. I thoroughly enjoyed my week or so at Coolmore Australia with this gentle giant. 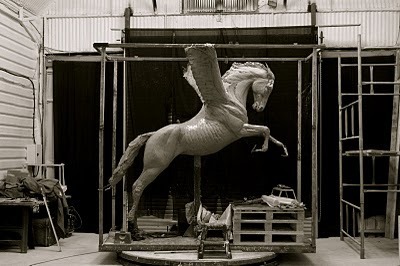 The life size bronze will be arriving in Australia at the beginning of December. The current golden boy of equine art, Charlie Langton is making his mark on the contemporary art world. His unique and individual style has distinguished him as one of the most exciting and inspiring sculptors of our time. In recent years, since the YBAs, there has arguably been a trend among contemporary artists to create shocking, innovative and controversial work. Charlie Langton’s work – that’s within the tradition of realism – therefore comes as a refreshing change. 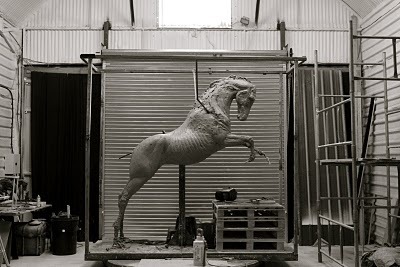 Langton is best known for his work on a number of high-profile horse sculptures, in the last few years including Yeats, Goldikova, Pegasus, Galileo, Sadler’s Wells, Montjeu and most recently Kauto Star, which will be unveiled at Kempton Racecourse on Boxing Day this year. Having spent his childhood surrounded by horses it’s no wonder they are his inspiration. Both his great uncle and mother bred racehorses and by the age of six, Charlie was fortunate enough to have a small Welsh Mountain pony of his own. Horses have always been an integral part of his life, and are a natural subject to him. So what is it that makes him so successful as a sculptor? The real art of sculpting, Charlie believes, is to truly know your subject. For him, observing their character and understanding the nature of a particular horse is paramount to achieving its final likeness. The initial stage of the artistic process is spent observing the horse, and chatting to those who know it best – its trainers, riders and owners. This research allows him to create works that so accurately capture the spirit and character of the subject. Thoroughbreds in particular inspire him. The attitude, character and physicality of the champion racehorses puts them in a league of their own, and it is their unique combination of power speed, elegance and grace that Charlie finds so compelling. create a bronze statue depicting the four-time Gold Cup winner Yeats, his work had to meet high expectations. The sculpture was unveiled by Her Majesty the Queen on the first day of Royal Ascot in 2011 to a warm reception, and it still takes pride of place at the parade ring today. for a better subject”. He speaks fondly and passionately of Coolmore Stud, the breeding organisation that looks after Yeats in Ireland. 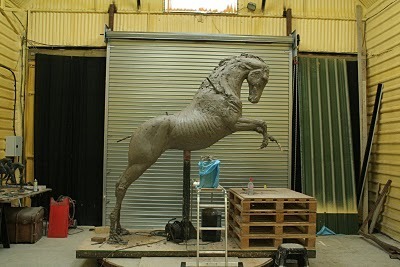 On a number of occasions Harry King, the manager at Coolmore Stud, would fly over from Ireland to Charlie’s studio in Wiltshire to watch the sculpture progress, and stay for about 30 minutes before flying back to Ireland. commissioned by the horse’s owner by Clive Smith. Charlie was asked to create a 5 per cent over life-size bronze of the great steeplechaser for Kempton Park Racecourse, to be unveiled there on Boxing Day this year. The sculpture was generously donated to the racecourse by Clive Smith and will undoubtedly be admired and coveted for generations to come. It is evident that Charlie Langton has a promising career ahead of him. You could be forgiven for thinking he may become restless within the arguably limited confines of his subject; however, he insists it’s easy to keep fresh enthusiasm an excitement for the project. “Every champion horse has a unique combination of attributes that sets him apart from the herd, it is the process of trying to establish what these are, and attempting to capture them, that I find so alluring. 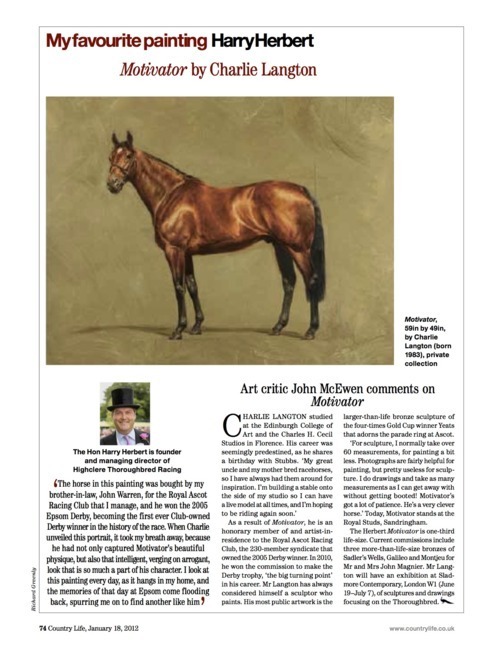 The thoroughbred could maintain my interest in the horse as a subject for a lifetime.” I for one am excited to see where his unique and extraordinary talent takes him next. 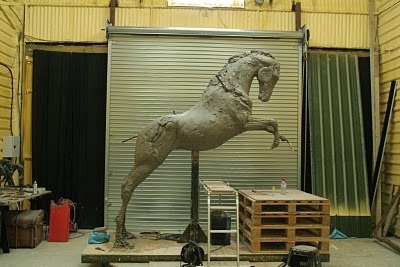 I have been commissioned to sculpt an over life bronze of the great Kauto Star by his owner Clive Smith. Very generously, Mr Smith is donating the bronze to Kempton Racecourse where Kauto Star won the King George V1 Chase a record five times. He is widely considered one of the greatest steeplechasers of all time and he is a real joy to be around. He is a very gentle natured horse with a brilliant temperament. He seemed very intrigued as I worked on the maquette in front of him. The bronze is currently being cast and will be unveiled on Boxing Day. It’s been a very busy 18 months or so and I have had the most incredible opportunity to work with Coolmore Stud. I was commissioned by Mr and Mrs John Magnier to sculpt over life-size portraits of Sadler’s Wells, Galileo and Montjeu. The three most influential sires in racing. It has been a wonderful experience and very challenging. I have leant an enormous amount from everyone at the Stud, especially Harry King, to whom I am extremely grateful. Their attention to detail is key the Stud’s success and amount of time and effort they have put into helping me with the project highlights just how much they all admire their horses. It is a huge privilege to work with them. This year I have been very lucky to have worked on some fantastic commissions. 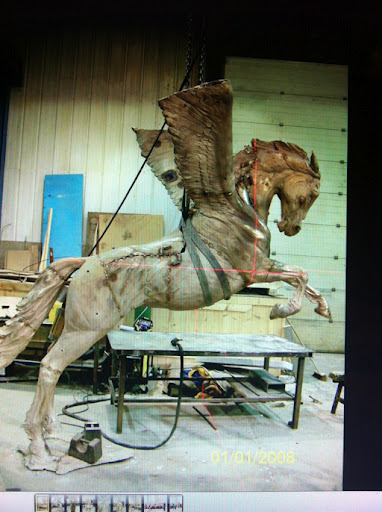 At the start of the year I was busy sculpting the life-size Pegasus for the Parachute Regiment and Airborne Forces memorial. It was a long and complicated project but an immensely rewarding one. I owe a huge amount to Mark Jackson “Jacko” who was responsible for involving me in the commission and not only sculpted Bellerophon and the over life-size Paratrooper, but acted as project manager for the commission. This role that took an enormous of amount of time and effort, and the fact that the memorial was delivered on time and budget is testament to his hard work. The project came to an end when the memorial was unveiled by HRH Prince of Wales on the wettest day of the year in mid July. The project involved a huge amount of different crafts and expertise and as a result I feel that I now have a great team of engineers, stonemasons, foundries and transport to make any project, no matter how complicated, work. It was a thoroughly enjoyable experience from start to finish and huge thanks to Jacko and all at the NMA and the Parachute Regiment and Charity for including me in this amazing project. The memorial can be seen at The National Memorial Arboretum in Staffordshire. It’s a truly inspiring place and well worth visiting. I was then back to more familiar ground with the very exciting commission of an over life-size bronze of the great Goldikova. The project overlapped with Pegasus as both were unveiled within two weeks of one another. I spent a lot of time in France , initially just before her last race in the Breeder’s Cup last year and then once she had retired at Freddie Head’s yard in Chantilly and then to stud near Deauville. She is a feisty character and I have the bruises to prove it. Measuring her was not the easiest thing I’ve ever done. These are the projects that really inspire me. Studying champion racehorses and trying to establish what makes them great. I find it fascinating. There was a small private unveiling in early August with Olivier Peslier mounting the bronze for photographs. It was commission that seemed to flow extremely well, thanks largely to all involved with the horse, who could not have been more helpful and accommodating. There were also installations of two editions of the over life-size editions of Yeats at Coolmore Stud in Ireland. I have done several trips there this year to organise and oversee their installation and also to discuss the new over life-size projects that I’m currently working on for them. These three sculptures are a huge project and I feel extremely privileged to be working on them. There will be more details of these next year, as they develop. I had a solo exhibition at the Sladmore Gallery in June which seemed to go well. It has always been an ambition of mine to exhibit with Sladmore and I was not disappointed. It was a real pleasure to work with all at the gallery and I look forward to discussing the potential for an exhibition in America, hopefully in the near future. Recently, I’ve been back in my painting and drawing studio working on sketches of hunters in red chalk and also an oil painting of Harbinger which I will be finishing shortly. I’ve been very lucky to have been so busy this year and thank you so much for all the support I’ve been given, both in terms of work and words. I’m loving what I do more every year and I hope that next year will be no exception. In order to create sufficient support for the wings a steel frame surrounds the whole piece to which the wings will be attached. The steel frame gives the whole work more stability and I can push on with massing in.